The eLearning system is a webbased solution. The eLearning system can be used as of PharmSchul light version. The assigned questionnaires and questions are also available. Unlike to a stand alone eLearning system, the questions and questionnaires can be adapted. 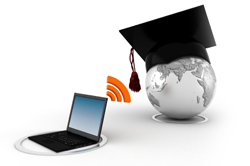 Furthermore it is possible to create your own eLearning modules. All needed information can be entered and managed by PharmSchul. The link to the training contents (usually a training video) will also be entered in PharmSchul - the assigned video will be automatically shown by executing the eLearning module. The training participation will be automatically transfered into PharmSchul after the successful examination of the test.